Since it's getting cold outside, it's about time for me to clear the cache of the rest of the food trucks. Hopefully you can find them again when it warms up again. After the food truck festival at Columbus Commons, I wrote about the Pickled Swine. The Pickled Swine is a deli truck. They didn't have many vegetarian items on their menu at the fest. However, after a recent visit, I discovered that the Pickled Swine has a veggie wrap and a couple of vegetarian sides on the menu. On my first visit to the Pickled Swine, I was drawn to the house made popsicles. Flavors include sweet corn lemon and basil, cucumber lime and mint, black cherry and goat cheese, and dark chocolate mint and habanero. The veggie sandwich is called the Oregonian. It is a cold salad wrap with lettuce and an assortment of veggies including spinach, peppers and mushrooms in a mustard dressing wrapped in a whole wheat tortilla. 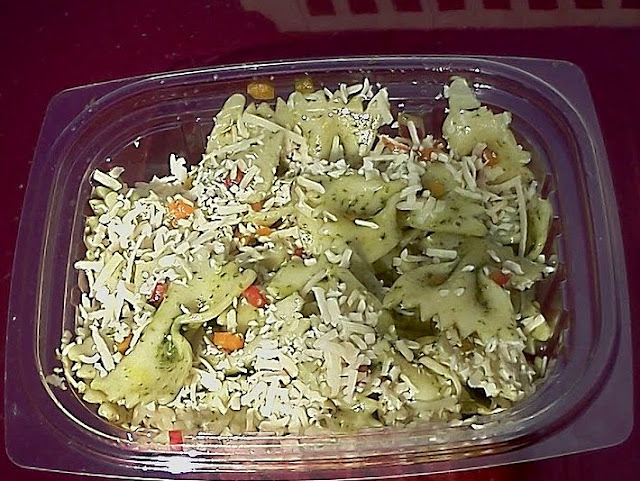 The bowtie pasta salad is tossed with asiago cheese, pesto, roasted pine nuts, red and yellow peppers and pesto. It had a fresh flavor, and the color was so bright that it exploded. My initial preconception that Pickled Swine was vegetarian unfriendly is unfounded. It's a fun truck that is worth checking out. Nick's Pizza is a cart that appears around Columbus and Westerville. The pizza is stone baked and is akin to New York style pie. The meatless slice at Nick's is the four cheese. It has a soft crust with a crunchy exterior. The cheese was nicely browned, and the sauce is bright and sweet. Overall, the pizza at Nick's is solid. I have a preference for the pizza at Mikey's Late Night Slice, but Nick's Pizza would be worth a stop if it's in your area.